The image viewer displays a SVG rendering of select proteins as bars, the lengths of which are proportional to protein sequence length. 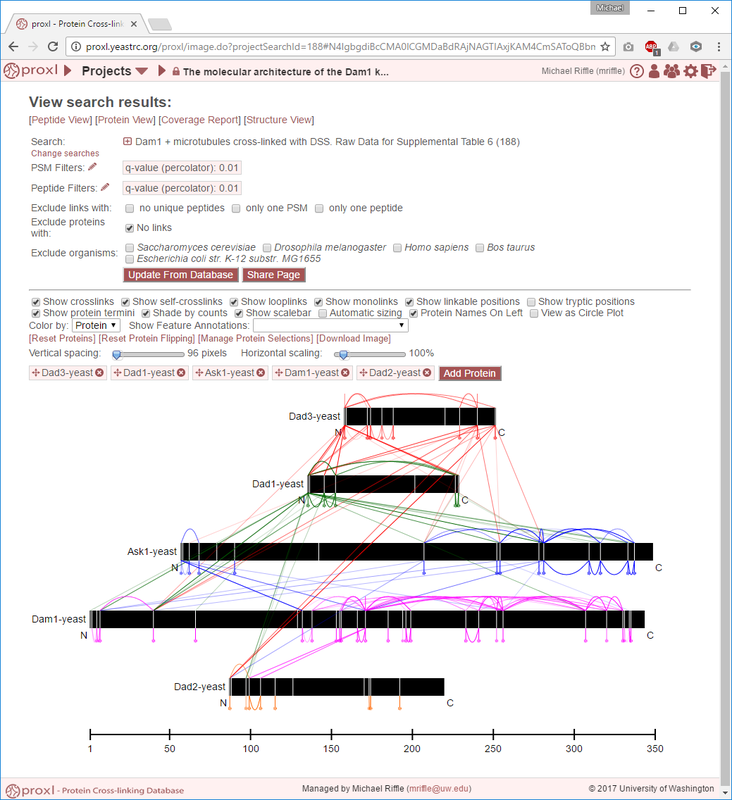 The bars are annotated with positions of monolinks, looplinks, crosslinks, and other biological sequence annotations. The viewer is highly interactive and contains many options for customization (see below). To switch to the “Circle Plot” view, click the checkbox next to “View as Circle Plot” in the viewer options. See Image View Page (Circle Plot View) for more information. 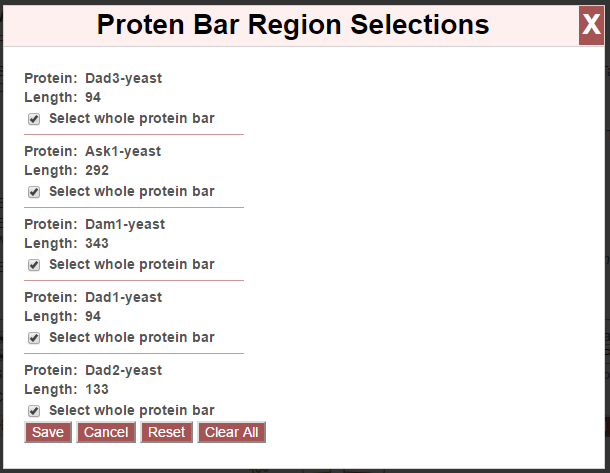 Below is a labeled example of a protein bar in the viewer, with most options disabled. Self-crosslinks, that is crosslinks where both linked peptides map to the same protein, appear as arcs on the top of the protein bar. These are contrasted with looplinks, where a single peptide contains two linked residues, which appear as arcs on the bottom of the protein bar. Monolinks appear as inverted lollipops (a line segment with a ball on the end) on the bottom of protein bars. By default, the coloring of the links corresponds to the “originating” protein in the viewer. For example, the first protein is colored red. All of its self-crosslinks, looplinks, and monolinks will be red. And all inter-protein crosslinks originating from this protein will be red. The originating protein of a crosslink will be the protein which appears first in the viewer (from top-down). Similarly, the second protein is colored green. All of its links and originating inter-protein crosslinks will be colored green. This coloring scheme is intended to ease confusion about which links originated at which proteins, farther down the list of proteins. The protein bars may be moved to the left or right by clicking and dragging the bars in the desired direction. By default, the protein bars are laid out left-to-right from N-to-C terminus. This orientation may be flipped by double-clicking on the protein bar. 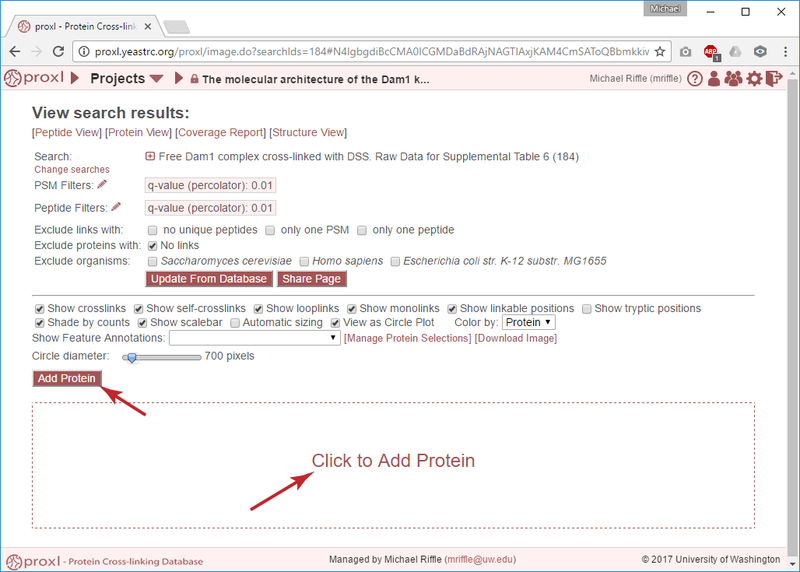 Local sequence information in the protein bars may be viewed by hovering the mouse cursor over the protein bar. A tooltip will appear that shows the amino acid position number, the amino acid at that position, and neighboring amino acids. Amino acids that linkable with the crosslinker(s) used in the experiment(s) will be bolded and red. Vertical bars indicate sites that are cleavable by trypsin. This tooltip will slide and dynamically update along with the mouse cursor as it is moved along the protein bar. Reset the positioning of all protein bars so that left edges are aligned to left of viewer. Sets the left side of all protein bars to be the N-termini. Toggle the showing of which positions in the protein are linkable by the crosslinker(s) used in the experiment. 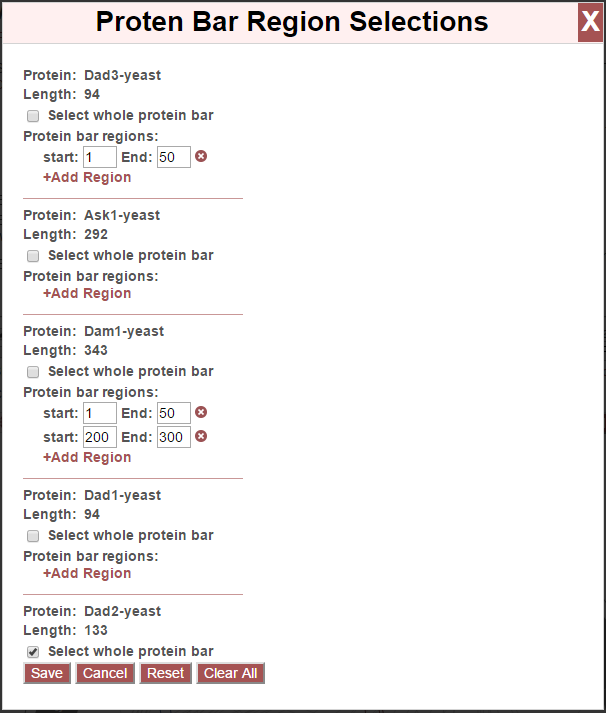 The linkable positions are noted by white lines in the protein bar. Toggle the showing of which positions in the protein are cleavable by trypsin, an enzyme commonly used to digest proteins in bottom-up proteomics experiments. The cleavable positions are noted by yellow lines in the protein bar. If both linkable and tryptic positions are being displayed, each type is displayed by a half-height line to remove ambiguity caused by overlapping linkable and tryptic positions. Linkable sites are shown in white on the top-half of the protein bar, and tryptic positions in yellow on the bottom half. Toggles the labelling of the N and C termini to the lower left and right of the protein bars. When merging multiple searches, this option changes the coloring scheme so that all links are colored by which search (or searches) they were found in at the given cutoffs. Each search is assigned a color, and each combination of searches are assigned other, distinct colors. It is possible to ascertain from the color in which search, or combination of searches, the individual link was found. A legend is provided beaneath the graphic. This functionality is limited to a maximum of three searches. The viewer automatically determines a single horizontal scale for pixels/residue for all protein bars based on the length of the longest protein and the width of the browser window–such that the longest protein stretches the entire width of the window. 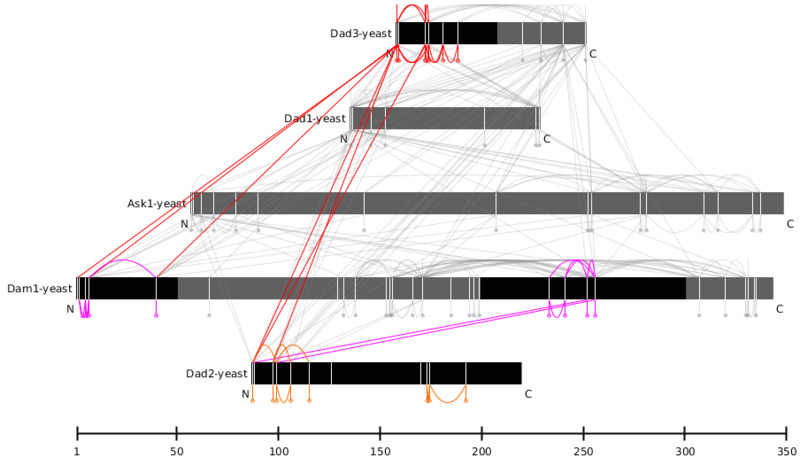 This scaling is dynamically recalculated and redrawn as the width of the browser window is changed or as longer proteins are added to the viewer. Additionally, the viewer employs a default vertical distance between the protein bars. This slider adjusts the distance between the vertical bars, slide right to increase the distance. This slider adjusts the the number of pixels per residue, as a percentage of the default. 50% means the bars are scaled to be one-half as wide as they are by default. 400% means the bars are 4 times as wide. Slide left to decrease the width, slide right to increase the width. 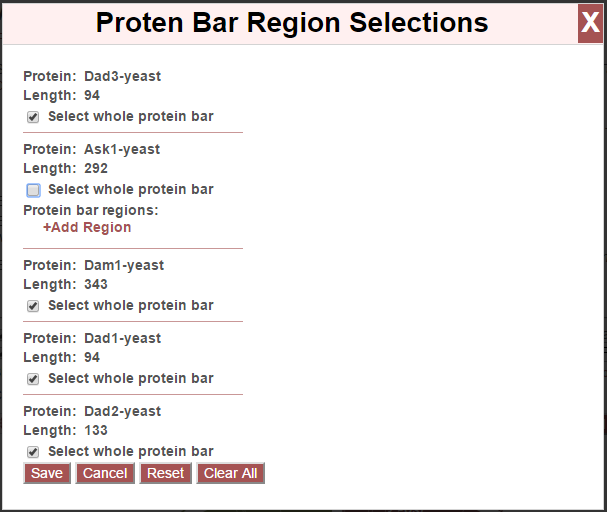 By default, protein names are placed within the protein bar, on the left side. This option will place the protein names outside and to the left of the protein bars.